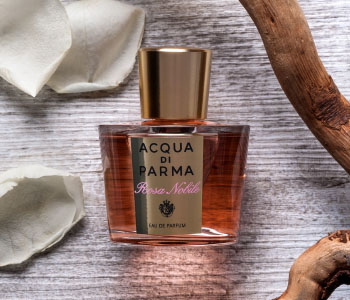 At the center of exclusive and private Italian gardens, in the shade of ancient trees, is where you’ll find Acqua di Parma Rose Nobile. Prized as the queen of flowers, the rose exudes a natural elegance that is both sensuous and sophisticated. When framed with the subtle heat of pepper, the vibrancy of mandarin, and the seductive warmth of woods and amber, the rose comes alive. Velveteen petals enhanced by harmonious floral notes in a crescendo of emotion.